We know it’s almost winter, but we love doing spring cleaning year round. 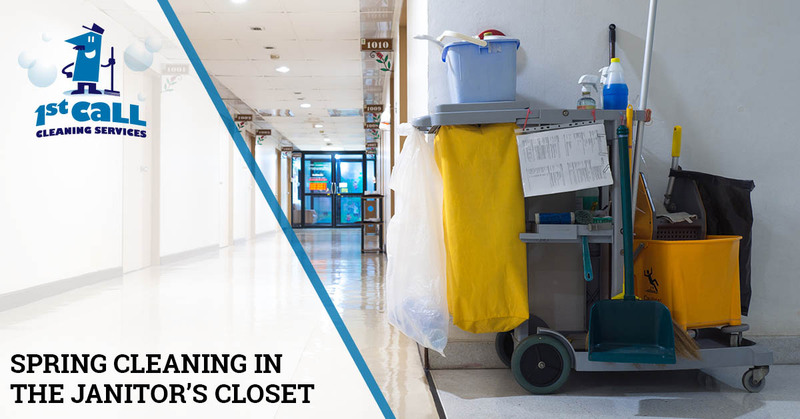 One of the spaces that often gets neglected at businesses is the area that holds cleaning supplies itself: the janitor’s closet. Sometimes, businesses don’t even have a janitor’s closet! If you want to skip the hassle of cleaning yourself or worrying about keeping your janitor’s closet stocked, choose a professional cleaning company, like 1st Call Cleaning Services in San Antonio, TX. Give us a call today for a 14-day free trial at 210-421-5011. One of the top reasons why the janitor’s closet never gets cleaned is because it is the last place we think to clean. The only people who visit this small, cramped closet are usually those cleaning. The public rarely gets to see this area — but that’s not a good reason to neglect the janitor’s closet. Another issue with the janitor’s closet is that businesses are often more concerned with cleaning larger spaces. As a result, the janitor’s closet is left in disarray or filth. We also associate cleaning products with areas being clean, so the fact that your soaps, mops, squeegees, and towels are stored in the janitor’s closet gives you the impression that it may itself be clean. Be sure to set aside time to clean the janitor’s closet. One easy solution is to create a chart that ensures employees are cleaning the space. Have your employees initial the chart to hold them accountable for cleaning the space. This is a great way to keep track of cleaning and stay on top of keeping the janitor’s closet clean. As we talked about in previous blogs, there is no room for old technology in your janitor’s closet. Things like buckets with broken wheels, string mops, and expired products have no place in your janitor’s closet. For starters, throw out and replace any broken items. If you aren’t sure your business will have money for this, allocate funds to take care of this. Start saving and incorporate cleaning supplies into your budget. It may seem like something unimportant, but your business is only as strong as its weakest component — cleanliness is a huge component of a business, regardless of the industry. After you have replaced broken or expired equipment or supplies, start replacing defunct technology. For inefficient items, like string mops, replace them with squeegees. If you’re using a handheld vacuum, consider upgrading to a commercial vacuum so you and your workers can get back to running the business after cleaning up. If you are tired of making your workers clean your business and seeing poor results, or wasting your own time and budget buying supplies that are never utilized to the fullest, call 1st Call Cleaning today. Our professional cleaning company strives to make each and every customer satisfied and happy. No matter the size of your business, we are happy to help your company regain its cleanliness. Call today to get a free 14-day trial at 210-421-5011.